We may have wrapped up the project for this one, but the hangover of so much fun and life is still lingering on. Thank you Street Konnect for choosing to work with us and we're humbled by your feedback. A small thank you note makes all the difference. A project we enjoyed working on thoroughly, where we introduced a novel concept of a wedding registry in India. Here's what the Founders of the Wedding Wishlist had to say. 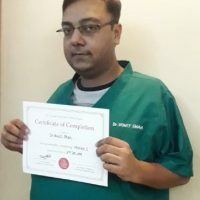 As we complete yet another writing program, we're humbled & encouraged with this testimonial received by Dr. Rohit Shah, a senior Periodontist and Implantologist. An eager learner, Dr. Rohit surprised us with his writing style. Thank you for choosing us to polish your writing further. We documented her 20-year career into a brand & showcased her work through profiling & a brochure. Today, we have Megha Kumbhar, the Founder & Special Educator at Nurturing Talents share a thank you note with us. Dr Shruti Bajaj, a Clinical Geneticist took our Online Writing Program and here's what she has to say. Thank you Dr. Shruti for your encouraging words. Munira Dalal, one of our students at the Online Writing Program expresses her happiness after successfully completing our program. She talks about how our course content helped her become more organized and methodical when it comes to writing. Read on..
We're basking in the glory of this encouraging feedback from a client, for a project successfully completed. Client testimonials always motivate and encourage us to keep doing the work we do and give our best. Here is a testimonial by Gaurang Chandarana, our recent client. Something which keeps us motivated and encouraged to do our best is seeing our happy clients who love our work. Here is a very encouraging testimonial for us by Sunita Mundra, founder of Muskan Collection. Read on..